I love to make jello shots for parties! 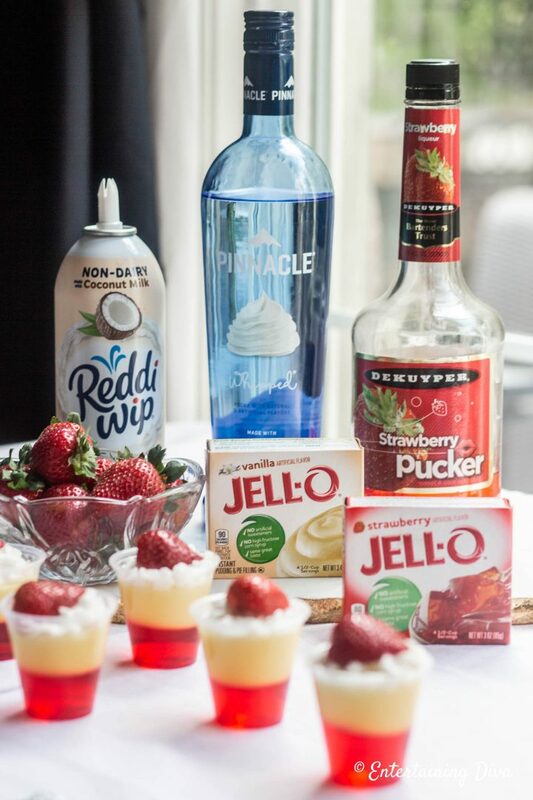 This red and white strawberries and cream layered jello shots recipe made with Whipped Vodka and Strawberry Pucker or Schnapps is one of my favorites for get-togethers with my girlfriends. I like to mix and match them with this champagne jello shots recipe and these cosmopolitan jello shots for a really pretty display. 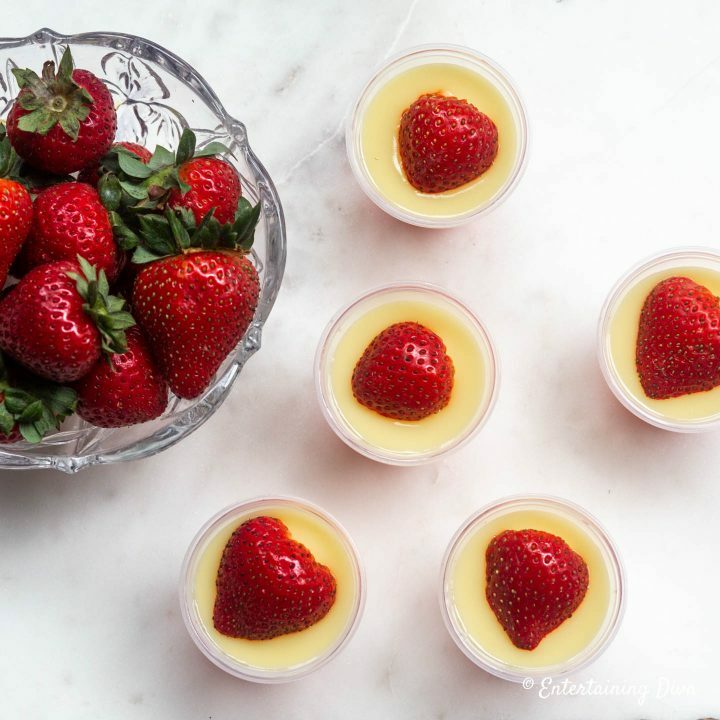 This strawberries and cream layered jello shots recipe is a sweet jelly shooter that is perfect for a party with your girlfriends! 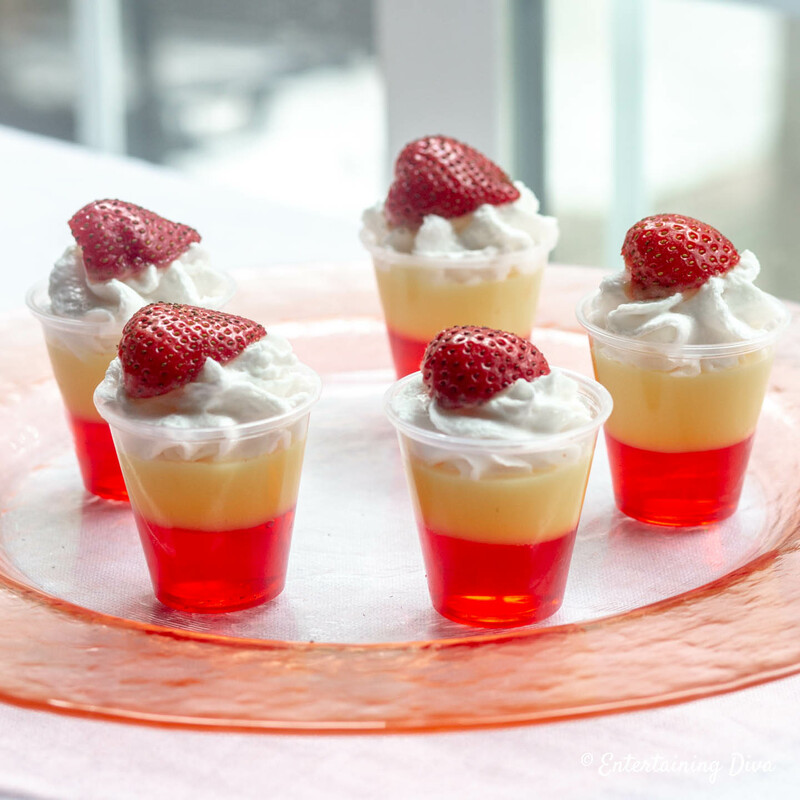 Made with Pinnacle whipped vodka and Strawberry Pucker as well as strawberry Jello and vanilla pudding, they taste like dessert and don’t have a strong alcohol flavor like some jello shots do. 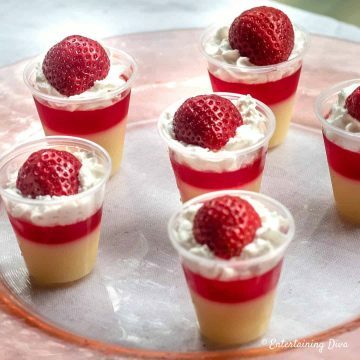 Because the second layer is made with instant pudding (which sets immediately), these layered jello shots don’t take much longer to make than regular ones. But look so much prettier. 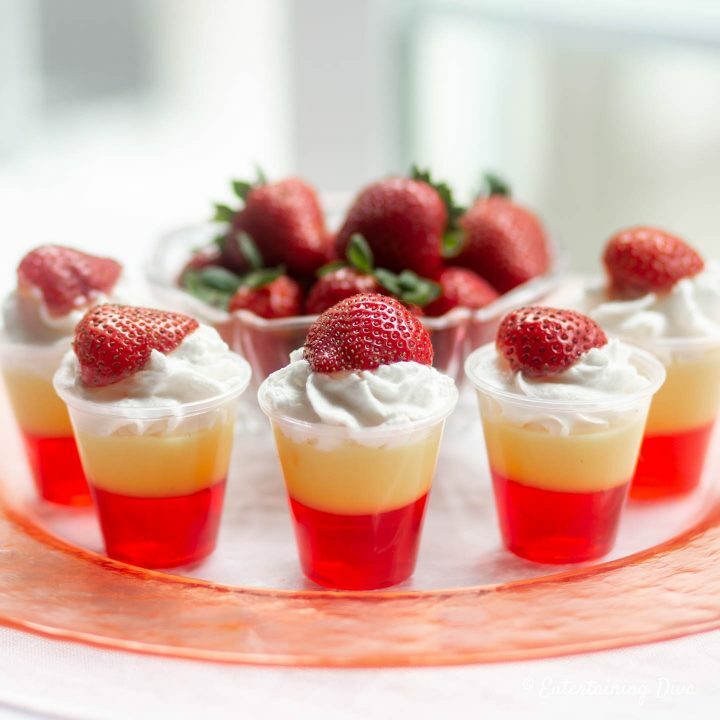 To make these layered strawberries and cream jello shots you’ll need Strawberry jello, Vanilla instant pudding mix (you can also use the heat & serve pudding mix but it will take a little longer), milk, Pinnacle Whipped Vodka and Strawberry pucker. I added some whipped cream and strawberries as garnishes, but these are optional. The jello shots taste really good all on their own if you can’t be bothered with the extra work. First you will need to lay out your jello shot cups. I always put them on a cookie sheet to make transporting them to the fridge easier. It also helps to catch any drips. 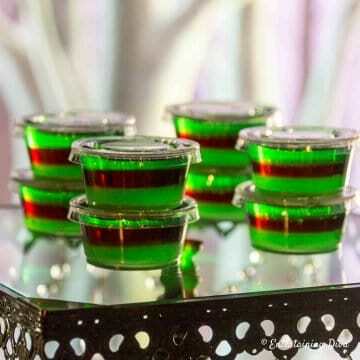 For layered jello shots, the taller jello shot cups* are better than wider ones. The extra height makes it easier to create layers without over-filling. Also, the jello shot cups should be at least 2 ounces in size. The 1-ounce shot glasses are too small to make good layers. The first layer is strawberry jello combined with Apple Pucker. 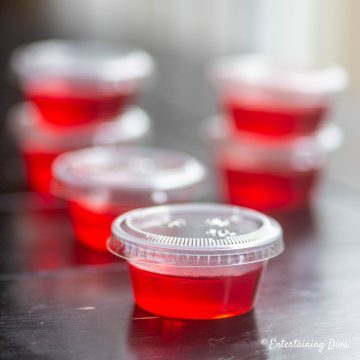 Mix 1 cup boiling water with a small (3-oz) box of Strawberry Jello. Then mix in 3/4 cup Strawberry Pucker (or Schnapps) and 1/4 cup cold water. 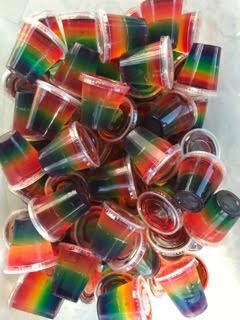 Pour the jello mixture into the jello shot cups so they are about half full. Then chill in the refrigerator for 2 to 4 hours until set. The second layer is the Vanilla pudding combined with the Pinnacle Whipped vodka. Combine 2 3.4-oz boxes of Vanilla Instant Pudding Mix with 3 cups of water and 1/2 cup Pinnacle Whipped Vodka. Spoon the pudding on top of the jello in the jello shot cups so that they are almost full. I use less milk than the recipe on the box calls for so that the pudding sets a little stiffer. You can’t put too much alcohol in this layer or it won’t set at all…which makes for very messy jello shots! Also, you can substitute Heat & Serve Vanilla pudding instead of Instant Pudding mix. Just make sure to wait until the pudding has cooled before adding the alcohol. 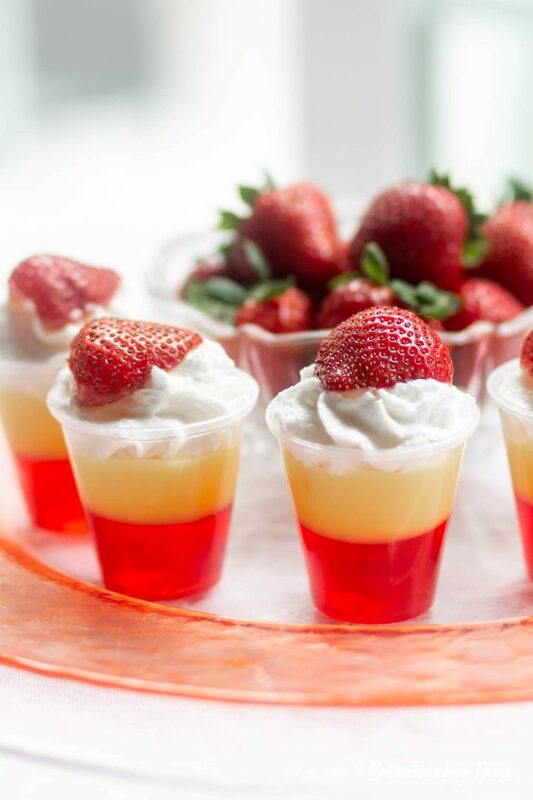 The pudding sets pretty quickly so you can eat the jello shots right away, or store them in the refrigerator until party time. If you want to use garnishes, add them just before serving. I like to use some whipped cream with half of a strawberry on top. 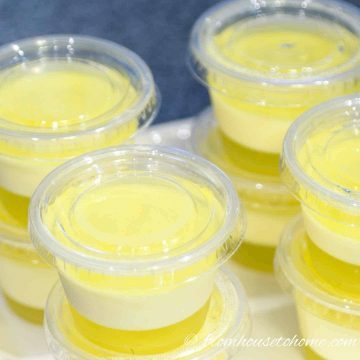 Since the pudding is a little softer than regular jello, serving them with a mini tasting spoon* makes them a little easier to eat. They taste so good, you could even serve them as dessert! 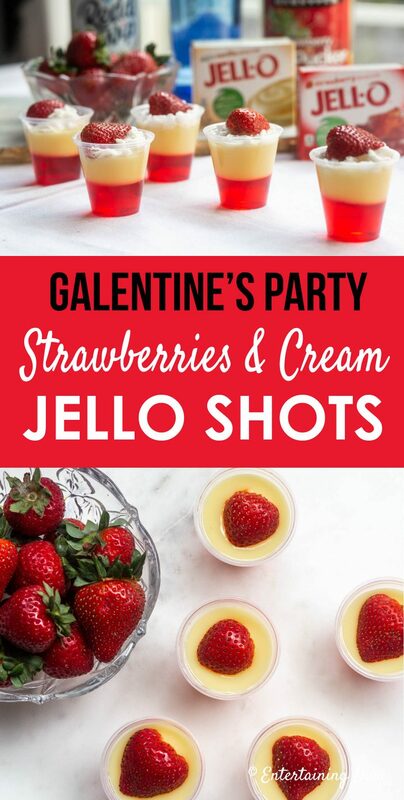 These strawberries and cream jello shots are a sweet shooter that are perfect for Valentine's Day, a bachelorette party, or any time you want an adult treat. Set out the jello shot cups on the cookie sheet. Pour the strawberry jello crystals into a mixing bowl. Add 1 cup of the boiling water to the strawberry jello and mix well. Add the Strawberry Pucker and cold water to the jello mix and stir again. Pour the jello into the jello shot cups so they are about half full. Chill for 2 to 4 hours until the jello has set. Pour the vanilla pudding mix to the mixing bowl. Add the milk and Pinnacle Whipped Vodka to the vanilla pudding mix in the bowl. Stir it constantly for 2 minutes using the whisk. Spoon the pudding mixture on to the jello in the jello shot cups. 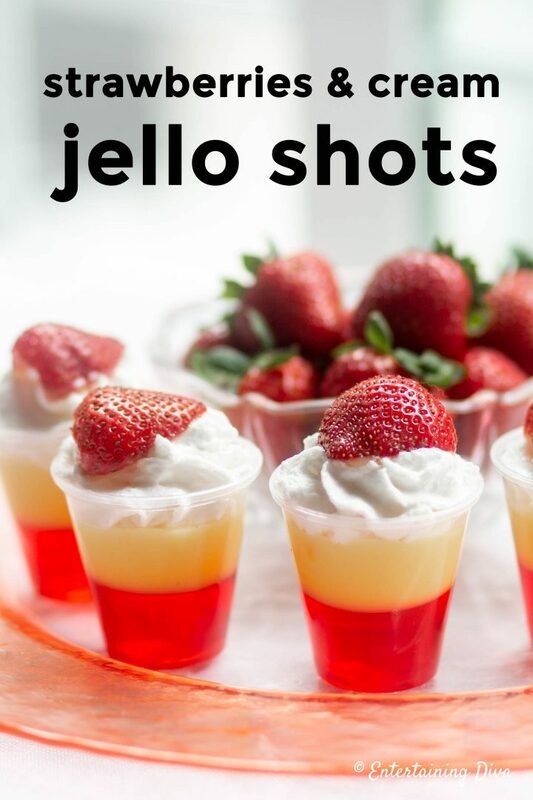 (Optional) Just before serving, add the whipped cream and half a strawberry to the top of each jello shot. Taller jello shot cups work better than wider ones for layered jello shots. 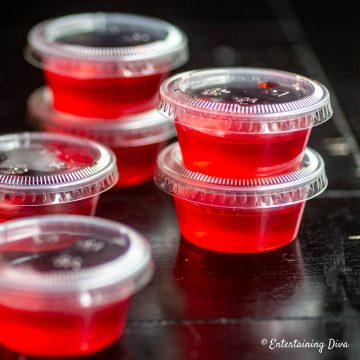 Placing the jello shot cups on a cookie sheet makes it easier to transport them to the refrigerator. 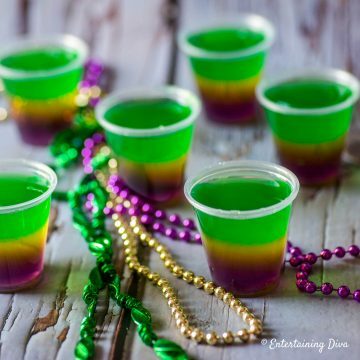 For the jello layer, you can add more or less alcohol depending on how strong you want the jello shot to be. Just make sure that the total amount of liquid added comes to 1 cup (if you add 1 cup of Strawberry Pucker then no water is required). 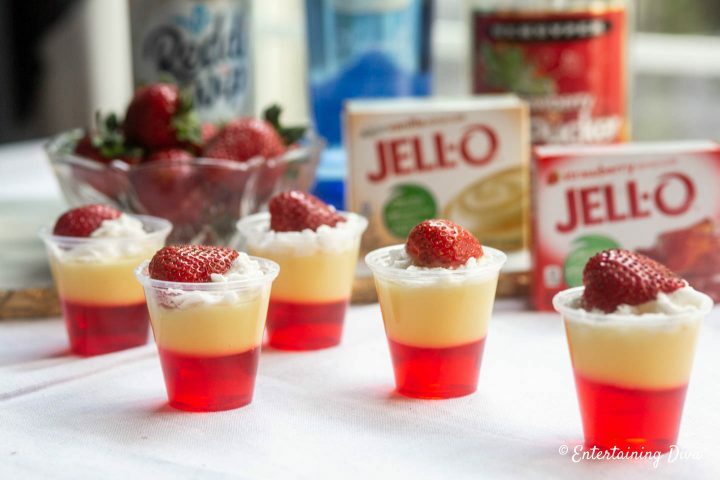 Have you made our strawberries and cream layered jello shots recipe? Rate it in the comments section below.